Wow….twice in one week an infamous pop-culture food item returns to the shelves. Oh HI-C….and your ECTO – COOLER. Nostalgia is a wonderful drug. This product was out in the late 80’s and lasted until 2001 and was discontinued. Fans have been raging against the machine for its return..but without any tie to a Ghostbusters product….Hi-C didn’t see the point. Bad move, that. 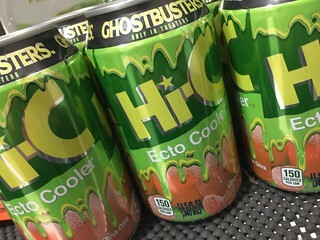 Flash forward to the news of a NEW Ghostbusters movie…and Hi-C got smart and announced they would reissue ECTO-COOLER!!!!!! That time is now. ….AND…..it’s just like I remember. It’s citrus-y sweet and such a neon green I feel like it could glow in the dark. It’s a perfect step back in time to when Ghostbusting was easier and Bobby Brown was a mainstay on the radio. And bonus….that neon-y, orange-tangerine, super drink makes a perfect mixer for adult beverages. Just saying…last night the JFC crew got SLIMED on this stuff!! !